Home General Post HP Stream 14 Windows 10 Laptop Everything ! HP Stream 14 Windows 10 Low Cost Laptop Launched – HP has tried to take on Chromebooks and the Asus Eeebook with their Stream Laptops with better specs and a new 14 inch model. HP stream series was launched in 2014 with little internal storage with the support of cloud computing and basic specifications to attract all the entry level laptop buyers who do not use heavy and CPU intensive applications and software and those who are looking for an affordable option which is good enough for surfing, writing and some multimedia entertainment. HP Stream was priced up to 250$ which made it a great success due to its large battery and slim design. 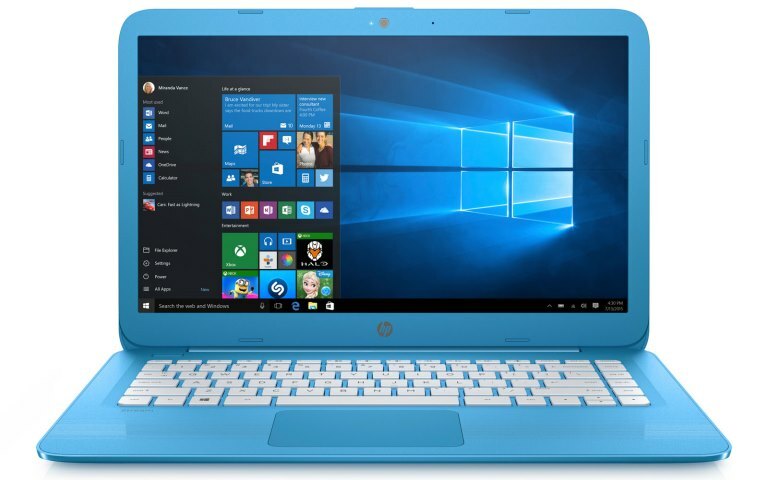 HP Stream 14 is a new budget Windows 10 laptop, which is launched by the HP Company. It is an upgraded version of Stream 13 laptop, comes with improved battery life and specifications. Improved connectivity, longer battery life, and sleeker design are the highlight of the new generation of cloud-based PCs. As the name suggests, HP Stream 14 is a 14-inch laptop starting at $219 (roughly INR 14,600). Stream 14 replaces the Stream 13 HP laptop and bumps up some under-the-hood specifications as well as the design. BIG Display Size: This budget laptop effectively replaces the 13-inch version and comes with 14-inch display with 1,366 x 768 pixels resolution. Portable Design: Despite the larger screen, it comes with the more portable design. Improved Connectivity: This laptop has faster dual-antenna 2×2 802.11ac Wi-Fi for better connectivity. Battery: It features a longer 10 hours and 45 minutes of battery life, which is great for a primarily online-only laptop. Bigger RAM: HP Stream 14 does support a bigger RAM i.e. 4GB with 2016-era Celeron processor. While the original HP Stream laptops shipped with Windows 8.1 operating system, the latest Stream 14 will be delivered with Microsoft’s Windows 10 operating system. This windows laptop is available in four color options – Blue, Purple, White, and Black. Like the earlier stream series’ laptops, the company has fixed its price under the budget. The HP Stream 14 Windows laptop will be available in the market at the price tag of $219 or INR 14,600 only. Share HP’s Windows 10 Budget Laptop: Stream 14 on the social sites and keep exploring the blog for more updates. Now the California based company, HP, has decided to launch three different laptops under the Stream series which are HP Stream 11, HP Stream X360 and HP Stream 14. The previous generation HP stream 13 has been discontinued and instead they have upgraded it to the 14 inch model which is the HP Stream 14. The HP Stream 14 is powered with a more powerful 2016 Celeron processor and a faster 2×2 802.11ac Wi-Fi. The internal storage is still a bit less at 32 GB but the RAM has been upgraded to 4 GB. The display size is 14-inch just as the name suggests with an HD Ready 1366×768 display resolution which is a great feature in this price point. It also has USB 3.0 port which is great for those looking for a faster data transfers. The battery pack is capable of delivering the energy to the device for 10 hours and 45 minutes, which makes it one of the most battery efficient laptop. The HP Stream 14 will start at $219 (around 14,700 INR) when it’s arrived on 7th September in the US. The other two laptops, namely HP Stream 11 and HP Stream x360 have an 11 inch display. Other than that they have almost similar specs to the HP Stream 14. They have the same 2016 Celeron processor, faster Wi-Fi, 32 GB of internal storage with 4 GB of RAM. Just like the Stream 14 they also have the USB 3.0 port. The main difference between Stream 11 and the Stream x360 is that Stream X360 comes with a 360 degree hinge just like their previous x360 laptops and the popular Lenovo Yoga series which can be configured into various display configurations for different purposes just like the Lenovo Yoga series. Though there is no final word about the availability of Stream X360 but it is said to be priced at $250(around 16,700 INR) which is $50 cheaper than its predecessor. It will be launched in select markets in September whereas HP Stream 11 will hit the stores in US on 24 August with a price tag of $200 (13,500 INR approx.). A more secure option with 64 GB storage will also be launched in September which will be called the Stream 11 Pro. Previous articleBluehost India Review! Wastage of Money ! At a Glance!